PNB says it has considered the offer from various angles, such as market conditions, the interest of stakeholders especially the minority shareholders. Kuala Lumpur: Permodalan Nasional Bhd (PNB) has defended its offer price for SP Setia Bhd and extended an olive branch to the board, which is resisting its bid to control the property firm. The state-run fund manager offered RM3.90 a share and 91 sen for its warrants but the board, which includes president and chief executive Tan Sri Liew Kee Sin, said the bid fundamentally undervalues SP Setia. PNB president and group chief executive officer Tan Sri Hamad Kama Piah Che Othman said many analysts had viewed the offer positively as it translates into a price earnings ratio of 19.8 times compared with Kuala Lumpur Property Index's 9.8 times. "We have considered this offer from various angles, such as market conditions, the interest of stakeholders especially the minority shareholders," he said in a statement released here yesterday. The statement explained the rationale for PNB's strong interest in the company which it regarded as a strong and well-run group with stellar performance. SP Setia, it said, has continued to be one of the most profitable property players and is highly regarded by the investment community. The market also views the company as having good returns po-tential, both in terms of dividend and capital gains and has outperformed the returns of the FTSE Bursa Malaysia KLCI in the past five years. "The offer is in line with PNB's long-term strategy of enhancing its investments in the property sector ... having a strategic holding in SP Setia would further strengthen our portfolio," said Hamad Kama Piah. He also expressed his confidence in the existing management team and PNB's wish is to work with them to continue to deliver value to shareholders. "This is a synergistic collaboration that blends the entrepreneurial spirit of SP Setia and PNB's record as a strong and supportive long-term shareholder, which allows the management to have an undivided focus on maximising shareholders' value," he said. 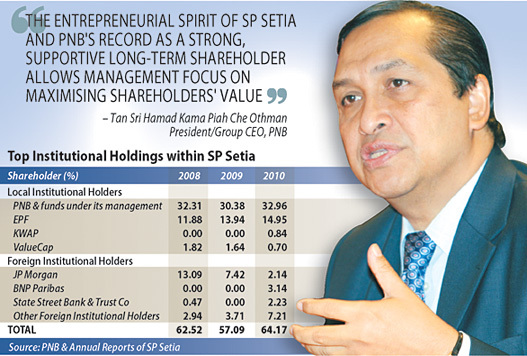 PNB has been a long-term shareholder in SP Setia since 2000 and has been gradually increasing its stake to being the single largest shareholder since 2008. Analysts have mixed views on the fair value of SP Setia, which ranges from a low of RM3.15 to a high of RM5.41. They also don't think a rival bidder will emerge although SP Setia's board plans to look for one. TA Securities senior property analyst Tan Kam Meng said in terms of financial muscle, only other government-linked funds will be able to compete with PNB. "However, it makes no sense for these funds to bid since PNB has already controlled the 33 per cent stake," he said. He added that should there be competing offers, based on SP Setia's current market value of RM6.9 billion, it would have to come from a group of investors. "The premium offered by PNB is below our discounted free cash flow valuation of RM4.45 per share," he said. Another analyst also said there is still a possibility of PNB raising its offer as plans to keep SP Setia listed is a recognition of its equity brand. "PNB has the money and it is very doubtful it would allow others to outbid it," the analyst said, adding that with most analysts in favour of SP Setia's refusal to accept the offer, PNB may just relent. Nomura research analysts Jacinda Loh and Raashi Gupta in their notes yesterday said if there is a competing party, it has to have solid enough financial backing and there is possibility it would end up not having full control. "There are chances of a management buyout," they said. On the chances of other major property players coming in to take over SP Setia, most analysts said it is very unlikely, given the current unfavourable economic condition. "For a group as big as SP Setia, there is just too much cost involved," they said. Tan said if PNB raises its offer and Liew accepts and leaves, it would be a disastrous turn of event unless PNB can find a replacement who is equally strong. High noon at E&O AGM?